Mapping the shape of the ocean floor – which includes dramatic mountains and gorges greater than even Mt. Everest or the Grand Canyon – is important for a few reasons. First of all is navigational safety so that ships can pass without loss of equipment or life. For example, the Northwest Passage in the Arctic Ocean is a well-mapped but narrow corridor; if a ship needs to traverse outside of the corridor due to ice or for sightseeing closer to shore, it risks running aground or into uncharted obstacles. The second reason ocean mapping is significant is for resource development such as oil and gas pipelines and cable routes. And finally, mapping allows us to better understand ocean habitat so we can protect and preserve it (ex. Predicting shellfish habitat in the Bay of Fundy, knowing where to build artificial oyster reefs in the Gulf of Mexico or how to protect glass sponge reefs in the Pacific). Dr. Church, through the Ocean Mapping Group at UNB, has been making significant progress on mapping our ocean floors for almost 10 years using multibeam sonar technology. Multibeams emit sound waves from the hulls of ships; because sound travels really well through water, the pulses echo back and provide data from which to determine the landscape. Church and his team collect and make sense of the data to give to organizations like the Canadian Hydrographic Service and the Geological Survey of Canada to map. He’s focused on developing new and innovative techniques and tools for the management, processing, visualization and interpretation of ocean mapping data. It’s a timely undertaking, given that the Seabed 2030 project is currently gearing up to outfit 100 ships that will circumscribe the globe for the next 13 years to map some 140 million square miles of seafloor. Projects such as this one will look to researchers for the newest and most efficient technologies and tools. UNB’s Ocean Mapping Group was established in 1988 in response to a national need to develop advanced ocean mapping capabilities. Leading the group was Professor Emeritus David Wells, who produced a plan and supervised the development of prototype software (which evolved into CARIS HIPS) to enable simultaneous processing of multibeam and other sonar data. Wells recruited Larry Mayer and John Hughes Clarke and the program became world-renowned. Eventually, Wells would move on to the University of Southern Mississippi and Mayer and Hughes Clarke to the University of New Hampshire, leaving an opening in 2016 for Church to take the lead of the Ocean Mapping Group at UNB. Today, the three universities are among the top in the world for researching and developing tools to advance ocean mapping and hydrography, and for training the next generation of hydrographers and ocean mappers. In fact, they get together three times a year to teach courses in hydrography around the world. A Fredericton native, Ian enrolled in Geodesy and Geomatics at UNB for land surveying, but after taking an ocean mapping class was hooked. He spent his last summer as an undergrad student in the Arctic with John Hughes Clarke and ended up spending the next seven summers involved with operating and managing the multibeam sonar system onboard the coast guard ship Amundsen, collecting as much depth, backscatter and sub-bottom data as possible throughout the Canadian Arctic. 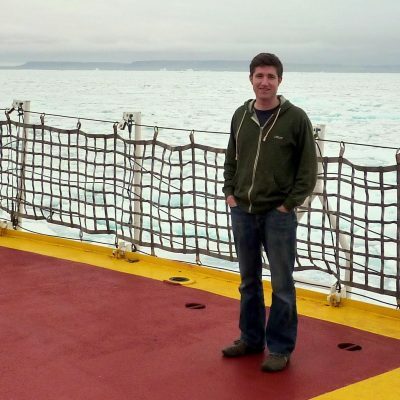 After finishing his Masters and PhD at UNB, Ian moved to the University of Southern Mississippi, along the northern coast of the Gulf of Mexico, as part of the Hydrographic Science Research Centre. Two years later he returned home to take the position of Assistant Professor in the Geodesy and Geomatics Engineering department. He and his students have been doing hands-on research across the country that is helping to map more of the world’s ocean floors. They’ve been crowdsourcing sonar data collection through Inuit fisherman who install equipment on their boats that sends information back through the cloud. It’s a win-win in that it’s more cost-efficient and the fisherman in return receive detailed maps that allow them to navigate to better fishing areas. The group has also been working with the Saint John Port Authority to better understand the sedimentation, circulation and ecology of the Saint John Harbour. 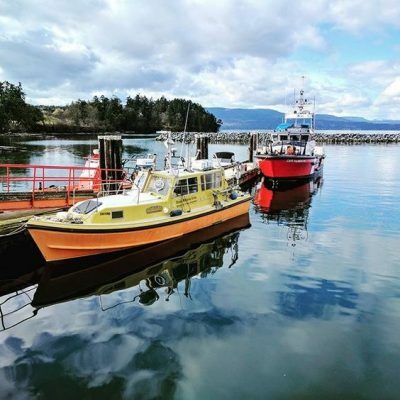 They’ve partnered with the Nova Scotia Community College, the Department of Fisheries and Oceans and Nova Scotia scallop fishermen to collect data from the Bay of Fundy that can help map and protect scallop habitats. And they’ve been working from their research vessel, the CSL Heron, off the coast of Squamish, B.C. to research better positioning, orientation, integration, refraction, seabed backscatter and water column imaging. Ian is hosting a UNB Geodesy and Geomatics alumni reception in Victoria, B.C. on March 27th as part of the CHC-NSC conference. If you’re at the conference or in Victoria, please join him, his students and fellow alumni!